One of the things that we as programmers accept in our line of work is the constant sitting down. Often we’re in the “saddle” for hours on end (8+ hours a day) and our range of movement is limited to picking up the coffee cup and putting to our mouths. Not only is this sedentary posture bad for your body, but it also leads to the possible development of a nasty looking hunchback later in life. Yeah.. that just looks painful. So what can you do to fix the problem? Can you really fix your posture after this many years of sitting slouched infront of the computer screen? This is something I asked myself earlier in the year after one too many sessions of “getting the kids to stand on daddy’s back and jump” caused even more problems than it was supposed to fix. Since then I’ve been on a mission to find out what I can do to fix my dodgy posture and go from hunchback to straightback again. Here’s a list of hacks I’ve come up with to fix dodgy programmer’s posture. This might sound like one of those fad things to do from a couple of years back, but I switched to an adjustable standing desk (with a hand crank so you can move it up and down easily) and the result was quite impressive. However, you do need to do the transition correctly or else you might do yourself some damage. When I first started I thought I’d have to stand all day to reap the benefits, but I found easing myself into standing was better. 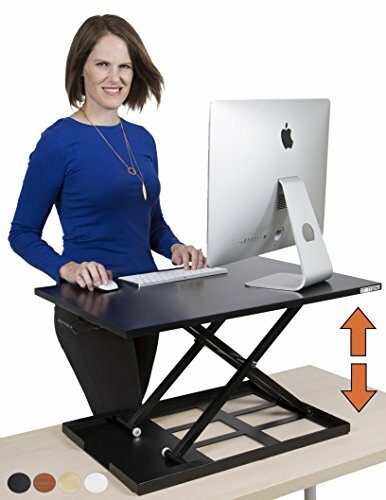 This immediately resolved a lot of the pain I had in my upper back and shoulders, but because I wasn’t used to standing up all day at my desk, it did shift the problem elsewhere. At first, my lower back felt fine, but after a few weeks towards the end of the day I would feel this numbness across my lumbar. It probably was a result of not activating my core enough, something you have to get used to doing. So the solution to that was to not stand up all the time. Initially I just dropped my desk height back down and continued working in my old chair. The problem with that was it was a little too comfortable and I ended up slipping straight back into old habits of slouching, leaning on the arm rests, etc. 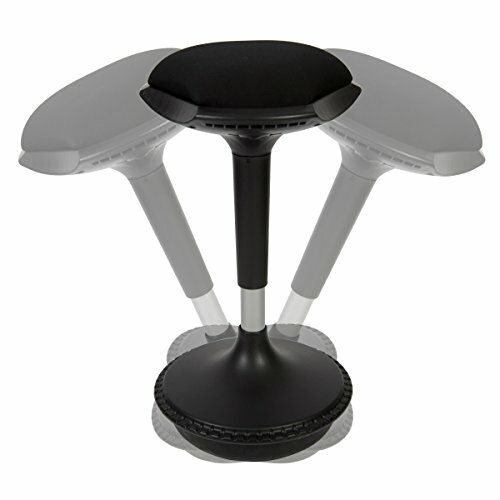 Eventually I bought a height adjustable wobble stool which let me lean on the stool when my feet or lower back started to ache a bit too much. The wobble part is really neat because you can lean properly without the stool feeling like it will fall over. This definitely helped and allowed me to get through the day without sitting down at all and after a few more weeks the lower back pain was gone. Even when sitting down, adding a footrest is also a good idea. Elevating your feet improves circulation and takes the pressure off the base of your spine. Searching for something to use, I came across an old foot stool that I made in highschool woodshop class and shortened the legs on one end so that it would be angled slightly. When standing up it means I was able to occasionally lift one leg up to take the pressure off that foot. Then I when the other foot starts to get tired, I just alternate to the other leg. Doing this really helps your ankles and takes the pressure off your joints by shifting your centre of gravity. 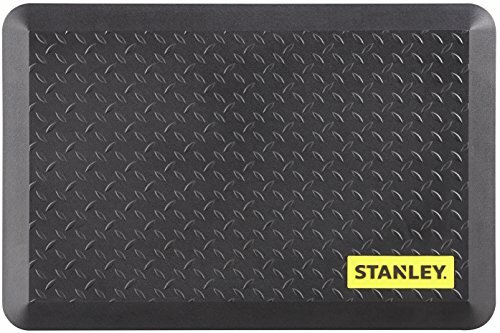 Have you seen those mats that people who stand behind cash registers have under their feet? 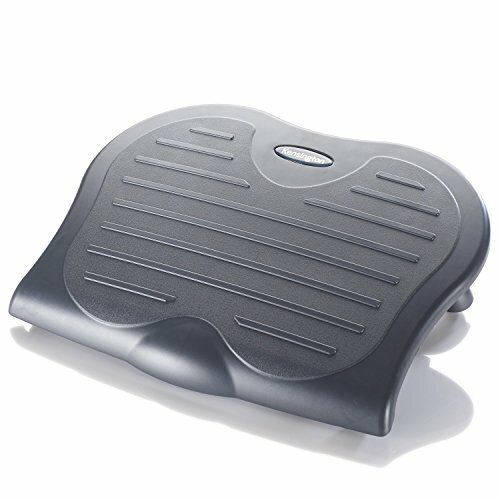 Most big supermarket chains have long recognised the OH&S benefits of pressure mats as they relieve the pressure you feel on the soles of your feet standing on a hard surface all day. In my case, our office is tiled and unless you’re wearing shoes it kills your feet if you stand on it in the same position for long periods. I went to a local hardware store and found these square tiles that they use on gym and yoga studio floors and bought four. I stacked two together and it basically gives me a 1.5m x 0.75m rectangle of pressure sensitive matting. The previous 4 points should get you well on your way to correcting the posture problem that afflicts most programmers. 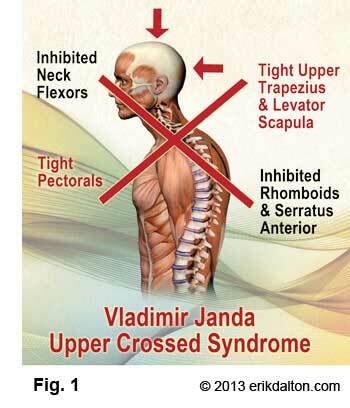 My final suggestion however is to consider purchasing a posture correcting kneeling chair. I found this kneeling chair that I replaced my stool with recently, and while it’s still fairly new, the results have been positive so far. 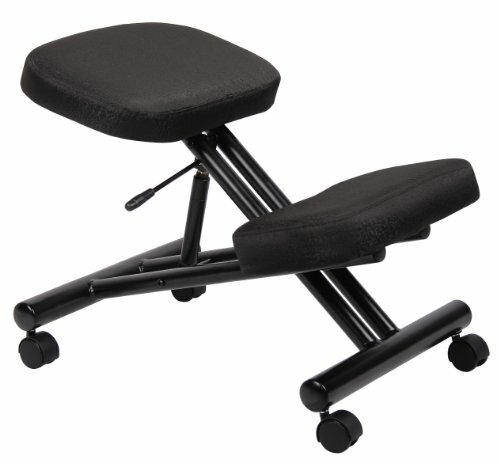 It keeps me elevated up to almost standing height while giving me somewhere to “sit down” when my body gets tired of standing. If you feel tired, sit down. If you can’t stand up for 8hrs a day, don’t beat yourself up over it. Try doing it for half a day or even a couple of hours here and there. Experiment and find something that works for you. Your back will thank you for it! Here’s a really useful infographic that I originally published as part of a larger post on the real cost of setting up a basic WooCommerce store. 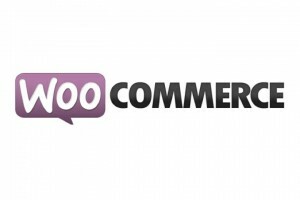 One of the things I love most about WooCommerce is the amazing array of extensions. Pretty much any idea or problem you can come up against in Woo is already countered by a plugin which attempts to solve the problem. As a programmer this is one of the things that has drawn me to both WooCommerce and WordPress. We recently released another new plugin also aimed at WooCommerce called Email Cart for WooCommerce. This is our second Woo-based plugin, Wholesale Suite was the first) and this one aims to solve the issue of sharing shopping carts. Not only is this a great way to increase the word of mouth on your e-commerce site, but it’s also a handy tool for shop owners to create pre-filled shopping carts and send links to them to their customers. Which is a nice way to reduce the work your customers have to do. Think about using this for complicated products where many products might be combined together in one order to make one whole. Alternatively you can use these cart links in your email campaigns so your customers just have to click the link and pay. Very low friction! Been a while since I’ve posted here, so I thought I’d drop a little code snippet helper function that you can put in your functions.php or plugin for retrieving a product via the SKU in WooCommerce. Since Woo doesn’t provide a helper function for retrieving a product via SKU this has come in handy a number of times. Hope it helps you in whatever project you’re facing. One of the products my company makes is a popular split testing tool for WordPress called Simple Page Tester (get it free here). It’s a free plugin supported by a Premium add-on version which provides more features like Custom Post Type support and Conversion Rate tracking. I track the stats on my plugin sales religiously and when I was reviewing the stats in Google Analytics I noticed that it had been featured on a prominent blog, the CrazyEgg blog, and it had sent a couple of sales which converted at well above the normal rate (a good indicator that the mention was in a positive light!). But I couldn’t find any mention of it in their most recent articles. So how do you find blog mentions when you’ve been featured on someone’s website? Check the screenshot above, the site:blog.crazyegg.com bit tells Google to only return pages from that website. Since I knew that was the domain that has linked to me I could then start narrowing down the field by searching for words that I thought they might mention when linking to me. The obvious one was the product name and that got a hit straight away. 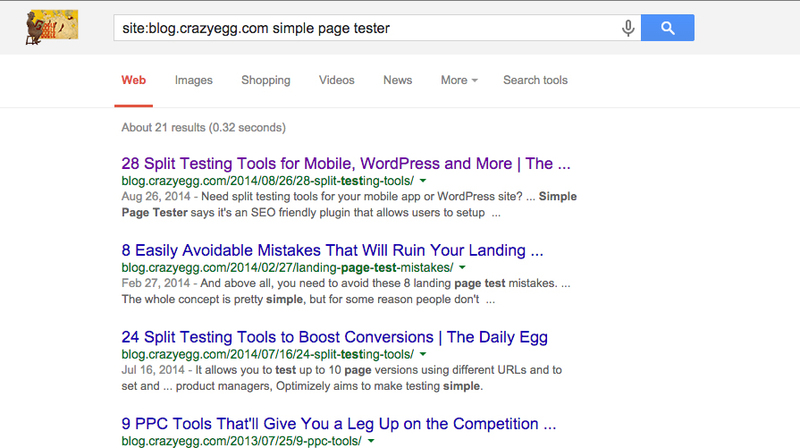 Sure enough, it was mentioned in this post which is a roundup of A/B split testing tools. That one mention over the past 4 months has converted at over 4.35% which is above the site average and the second best conversion rate from that period (the first is the free product’s sidebar which mentions the premium version’s features). So what can you get from this kind of information? Well for me, it says that getting featured in roundup posts is great for sales and it would be worth my time to get a couple more mentions like this. If those new mentions convert well then I’ve found another great marketing method for my product. I hope this little Google trick helps you track down those helpful folks who linked to you and uncovers some potential marketing ideas for your product or website. Pretty much every week I get some variation on the following question, but this guy was one of the few that actually posed a proper question without wanting me to just solve it for him. I asked permission to post the exchange in the hopes that I can direct people here in the future when they’re after my advice on the “how do I start” question that always comes up. I’m a freshman computer science major and am about to complete my first class this semester. I’ve learned a good deal of C++ as my first language. My question is this: what should I do if I want to start learning other “things” like graphics (we’ve only made console apps) using libraries like SDL, Ogre, OpenGL, etc. or if I’d like to learn to make websites? I think being able to build a website would be an amazing skill. With my background of console applications (I’ve covered all the basics of programming by now), what would you suggest as a first step towards being able to develop on the web? I want to work part time through college when I have the chance, and definitely work on a few projects during the summer. Thanks for the email and for reaching out. Since you have a good grasp on the basics already my advice would be to focus on doing something really cool in the field you want to be in and just go deep learning all the skills you need. The Internet is awash of free tutorials if you know what specific skills you’re looking for. If that field/focus is web development, make a website or better yet a web application/tool surrounding something you’re really passionate about. Web apps are really great fun to work on from a coding perspective and knowing you built something that people find useful is really rewarding. If there’s one thing I wish I could do if I had a time machine to go back to my uni days it would be to work on more things I am passionate about without necessarily focusing on the money part of it. Money comes later and most importantly money comes from doing cool things. So just dive in and do cool things. I know this response was more centred on programming but this covers starting freelancing, programming, web development, app development, design, or pretty much any creative online pursuit. I sincerely hope this helps you. The main point I’m trying to make if you didn’t get it is to start and don’t worry about the money. Do something cool, anything that you’re passionate about and the money, ideas, fame, will come eventually. But you can’t do any of it unless you start. If you’re in the market for some cheap but still good quality hosting then you should checkout what Bluehost are doing. The deal is $3.95 per month and then they also have a 50% discount on all add-ons sitewide so you can really save quite a bit of money. We did a review on the Pro hosting account a while back and it’s been very popular. Click here to read that. Happy thanksgiving and whatnot 🙂 Hope you make the most of the holiday season.